What could be better than playing pretend with your kids? You should see their faces when they get to play pretend in Nurse Costumes designed to look like the real thing. Nothing aids imaginative play as much as dressing like the real thing. 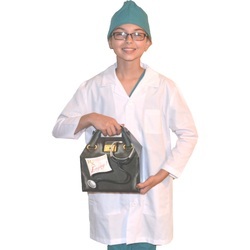 At www.mylittledoc.com you can find kids scrubs for the little doctor dreamer in your life to act out their fantasies. Dressing the part will aid their imaginations and help them spend hours of fun acting the part. Seeing them in tiny scrubs will also bring a huge smile to your face as you picture your grown up scrub wearing child. 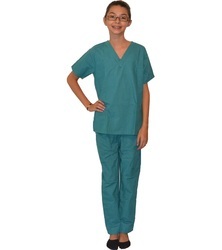 Don't forget to add a Lab Coat to complete the look of this scrub set. Add Personalized Embroidery and make it a special gift. 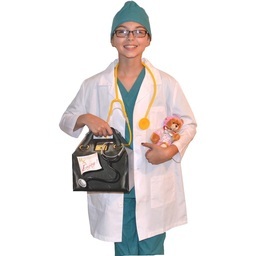 Little Doctors and Nurses love to wear costumes with royal colorful scrub sets. Your little nurse will love wearing this authentic costume. 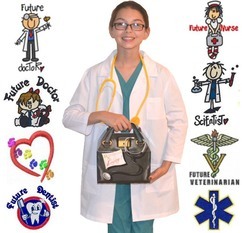 Every little doctor or nurse needs a set of these Kids Scrubs! Every little doctor or nurse needs a set of these Purple Scrubs! This costume looks awesome with an optional embroidery design. Your little nurse will love wearing this fun Kids Lab Coat. Includes a cute Bear wearing Scrubs! Your Future Nurse needs one of these costumes!